My battle buddy and I made the trip to XSite - The Outpost today. We were looking for something Urban with both indoor and outdoor sections. Sites like this seem to be in short supply in the South East, this was recommended by a number of players on FB and on these very forums. We hadn't heard very much about the site beforehand though. It is a small sized Urban CQB environment, with small areas of elevation on the outside, with none inside. 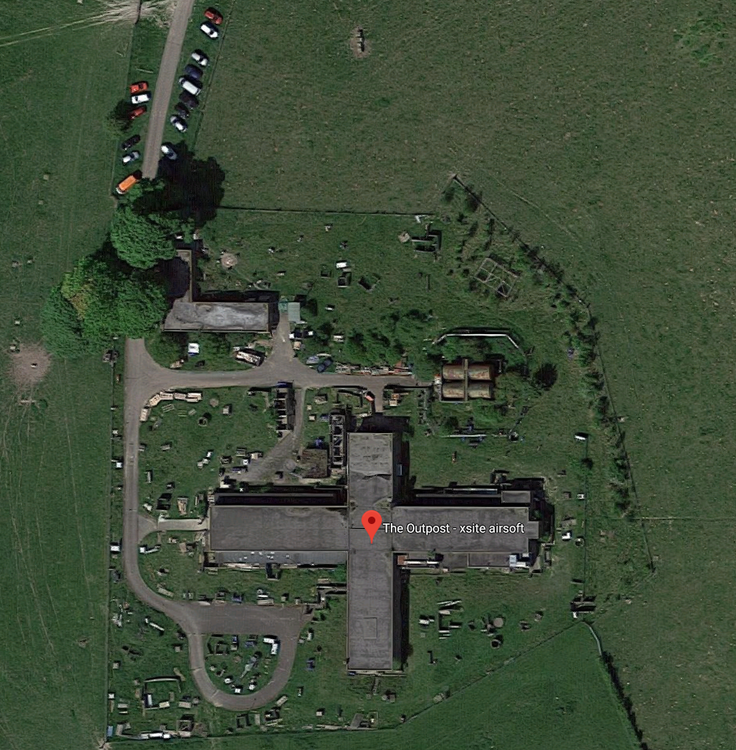 We believe this used to be an old WWII listening post/radar station (Cheers @clumpyedge for the info) As in the name, this is a large X shaped building with multiple entrances. Indoors is typical CQB chipboard walls, very dark, ultra close combat that you would usually find in purpose built arenas in the north of England and the USA. Outdoors is much akin to wasteland with LOTs of purpose built buildings, some multi storey, cars, vans, small heathland etc. The views coming into the site are pretty breath-taking as the Bucks/Beds/Herts countryside is some of England's best. Playing area: Pretty much everything on the site was close range, though with some opportunities for long distance engagement outside. Although the site has a small footprint, we never got bored. The purpose built obstacles kept things interesting. Indoors can be a little bit samey due to the chipboard walls, but again we didn't get bored as it was as tense as CQB comes. Shots do come very tight so we recommend you suit up! Safe Zone: Not a word of complaint about the safe zone. XSite restricts the amount of players to 40 so there is plenty of room in the old building to set up. Everyone had a table and a chair if they wished, the shop and canteen were all in one area. It felt safe inside, whilst not warm, it wasn't cold either despite not having heating. No wind got in, we were comfortable. Marshalling: The Marshalls were definitely hands on (In a good way). They listened to complaints and took action, whilst they had plenty of laughs to share, they were dead serious when they had to be, punishments were meted out for people who bent the rules or didn't call hits. Mandatory Chrono: Everyone had to go through Chrono. Max AEG FPS was 350. No Sniper rifles, CO2 guns or DMR's allowed on this site and they aren't really needed. Food: Dead chuffed about this. Pizza was part of the walk on fee. I mentioned that I had a dietary requirement and they made damn sure that I had the pizza I could eat before anyone else can get to it. When there was some left over, they made sure I got to it first. I have to admit, I felt important. It almost felt like they knew I did site reviews... If you didn't like Pizza, you could ask for a burger instead. Free Teas, Coffees AND hot chocolate, which is a very welcome feature. Drinks were competitively priced at £1.25 per bottle and chocolate was 60p a go. Shop: Admittedly small, but there was a variety that catered for all needs for the site, Gas Pistols, AEP's, rifles and even a Tavor bullpup. Had full chest rigs, wide variety of mag's and gas. Parking: Plenty of parking, less then 5 minutes from the safe zone. It seemed safe. You park on thick grass so would have to be really poor weather to get very muddy. Clientele: Everyone was very friendly. This site operates a 16+ only rule. Players were mostly mature and good natured. This would have been a positive, but as the day wore on, hit taking waned and tempers got a little frayed. More to do with the close nature of the playing field then anything else. Game Modes: The game modes were a bit lacking, most were attacking, defending then pushing up. There was one game mode where you had to put your teams case on top of a car, the last game mode was 4v4v4 with a random free for all interjection. Looking at other reviews we know that they do more varied game modes then what we experienced. Cost: The skirmish was £35 each, the most amount we have paid for any average skirmish. It was somewhat worth it, the food was good and there is a degree of exclusivity from having a number cap and the uniqueness of the site. Comments during Safety Brief: There were a number of comments towards a certain sexual orientation during the safety brief. This was not the same as your standard bit of good natured homoerotism that most airsofters like to partake in. We independently felt that the comments made at the beginning of the day by a member of staff, whilst in the form of a joke were pushing the realms of acceptability. If I were so way inclined, I would have felt a bit unwelcome. No Range: No range so to speak of available. Though there were lots of structures to shoot if you wanted to test accuracy. It would be nice to have. Toilet: One portaloo that we could see (We could be wrong). It was in good shape, though it was out in the fire zone so could only safely go in it between games. However if this one toilet got messed up by someone having difficulty, it could have caused problems. Sign and Directions: Very minor negative here. We could have done with some better directions on the website or event page. The sign at the entrance to The Outpost was mostly green with green writing on it. Not particularly easy to see from a distance when in a car! I hold my hands up and say I am not a huge fan of CQB, you need to have a strong pain threshold for inside the building. But we really enjoyed this day. The site is great, we took an absoloute hammering with various wounds, but came out smiling at the end. There clearly has been a lot of work on this site. Photos and video that you find online do not do the playing area justice. It seems bigger in real life to us. The Facilities are good, the people are friendly and you will have a decent time. As Urban sites are at a premium we do recommend you check out The Outpost in the future! We intend on coming back. Bullpup Watch: At least 3, All L85's. Not bad for the numbers at all. Its an old WWII listening post/radar sight of sorts not a barracks, if you noticed on the side of the hill looking back in the direction of the road you drove in on you would have seen a white lion (I think) which is actually Whipsenade zoo. If you also noticed a lot of birds in the air that generally means they are flying the American Bald Eagle from just above where the mural is situated. Thanks for the info. Will change it shortly! We did go by Whipsnade, though they didn't have the eagle out! I had to travel to Balham first, from Balham it was just over an hour. YES!!! I had no idea of this place, so a CQB site I could realistically get to now Mall is closed! Will get booking for March.. It's no mall. But I cant see many places around the M25 that does this form of Urban CQB on such a scale. Check out there FB page for more photos. This is my local site, I find its a blast the cqb is very fast and up close. As you say @Asomodai having lunch included is very nice and I think worth the little extra you have to pay. The outside doesn't have the long range of many sites, but this does mean that you are always in range. Just comes down to accuracy and how good a shot you are, or just how windy it can be ha ha. @Robert James it's just 20mins from mine to give you a bit a better time to travel estimate.